Eli, we now have six motos that have been raced, and you’ve been able to come on top of all six. You’ve tipped over. You’ve gotten bad starts. You’ve gotten good starts. It doesn’t seem to matter what the scenario, you’ve been able to come out on top. Tell us about round number three of the Lucas Oil Championship. Eli Tomac: I just wanted to come here and have a good day and a good result. I’ve had some funky stuff the past few years, and obviously the big injury in ’15. I wanted to get past that. This is as good as it gets, but even a podium or whatever, it would have been a good day for me, just the way this place has been the past couple years. I felt really good all the day. Early on, [it] didn’t have a whole lot to it. After the first practice, I was like, man, it’s going to be pretty easy. But by the time the second practice came around and the first moto, it seemed like it got good character. Some of it was a little bit…. You’d follow a guy, but there was at least a couple lines that you could make up some time and make moves. Ken, the outdoor series, we’ve missed you for a little while and now you’re back, and not only back—you’re making a statement that the injury appears to be behind you. You look to be getting stronger each and every time we see you on the bike. What’s your health at this point in the year? Ken Roczen: My hand has been kind of the same for the last couple weeks, just because when you have inflammation, for example, that I have in the thumb, it’s like tendonitis, and because I aggravate it pretty much on the daily, it doesn’t really go away. Actually, today in the practice and everything, it didn’t feel that great. I’ve had days before where my thumb was pretty good recovered and I at least didn’t feel it too much in the beginning. Of course, towards the end of the motos it usually gets a lot worse. But it was kind of crappy from the beginning on from today, but it just kind of stayed right there. It almost felt better in the second moto than it did in the first. It’s so weird. I don’t even understand why. I’ve been getting stronger and stronger, more so racing fitness because being back on the bike and now having a couple of races under our belt. We’ve been getting some good starts. Obviously, here I always like that track. It was a lot drier today than I feel like it was in the previous years. Overall, I’m more than stoked to be back on the podium. Blake, this track has been good to you in the past, and today it seemed to be good to you again. Take us through your afternoon as you finished on the podium again. Blake Baggett: Definitely had some good luck here in the past. To come away with 3-3 and end up on the podium is good. I’ll take anything I can get at this moment. The first two rounds were not pretty. Just plugging away at it. We’re doing a lot of testing and trying to get comfortable. KTM has been helping us a lot. So from the first round to now, we’ve made big improvement and can actually see the guys that are winning the races and not almost getting lapped by them. Just plugging away at it. Going to take this break and try to find a little more speed so that I can battle with these guys a little more towards the end of the motos. For all three of you guys, obviously the first moto was unusual with the red flag. How did it affect each of you? Roczen: I don’t think any of us really knew at first what was going on because I feel like the red flag came out all of a sudden. But I think Kyle [Chisholm] went down, and obviously that’s a bummer. I was kind of not pissed, but I got into third and obviously Justin [Barcia] and Eli, they were up front a little bit ahead of me, which meant that I had a little bit of a clear track and not eating roost the whole time. I felt pretty comfortable on everything and I felt like I could have put on a charge. Then, obviously, the red flag came out. It’s always difficult to restart and regroup. Helmet’s dirty and you’re starting to sweat already. It is what it is. It’s for everybody the same. Kenny, for the time you’ve had off, have you been impressed how well you’ve done so far after just racing these three races? Roczen: Yeah. I am just because little time on the bike, and obviously we went from Glen Helen, there were a lot of other things. Sickness the first race. There was something funky going on, and obviously we went backwards rather than forward. Had a good weekend last weekend. I think it’s more so just after already Hangtown, which is just one race, it started feeling a lot more familiar again. I feel like now finally I’m going to the track just having fun instead of thinking about, “This is my first race back after being off for months.” So I’m just currently having fun and trying to get even more familiar with it. Trying to do some motos throughout the week, too, just to get more familiar with the distance. Eli, you had mentioned yesterday that you wanted to get an overall here and check that off your list. When you crossed that finish line, describe that feeling of checking it off that list and what it means to win here in your home state. Tomac: It was just awesome. It was just something I wanted to do, and it happened. You wake up and you want to do it, but you still got to go out there and do it. I think we’ve just been in a really good spot the whole year and this was the time to do it, and we were able to get it done. Just feeling really good on my motorcycle right now. Ken, what is your schedule during the week? How much riding can you do? Do you do testing? Do you do training? What do you do at the off-weekend? What’s your schedule right now while dealing with the injury? Roczen: Lately I’ve done more testing, especially after Hangtown. It was tough because I felt super weird on the bike. I haven’t had any time to test and we were pretty far off. Most of the days that I was riding, I was doing a lot of testing just to try and get some kind of base that I can deal with. Then I tell them that you have this much of my time, and other than that, I have to go out and do my motos and get my training in, also, rather than just testing all the time. Then it’s just getting comfortable on the bike, which is super, super important. It’s important to get a good base that you’re decently happy with, then you can go on from there and you can squeeze a couple of things in it before and after your motos. So mostly it honestly have been trying to just test and pick through some stuff and get comfortable. It’s more so suspension than anything else. How much will the weekend off help, do you think? Roczen: A lot, actually. My plan was getting in—because obviously I’m still trying to just play catch-up. I’m going to go back and just try to put in a lot of time and use that off-weekend for some good recovery, also, but mainly just focus on my riding and do laps, a lot of it. Eli, just describe the incident where Barcia went down in the second moto and you almost got by him, and then you got hung up. That was pretty crazy there. Tomac: Yeah. That hill is just the man-eater hill, I guess. It seems like every year, someone has a moment there. Justin got kicked huge, big-time. It could have been really bad before he crashed, and he kind of half-saved it. Then he dumped it over and the bike was in the rut. Luckily I was able to hit the brakes beforehand and then not have someone right behind me. I got passed, but the whole situation was a pretty good outcome for what it was. 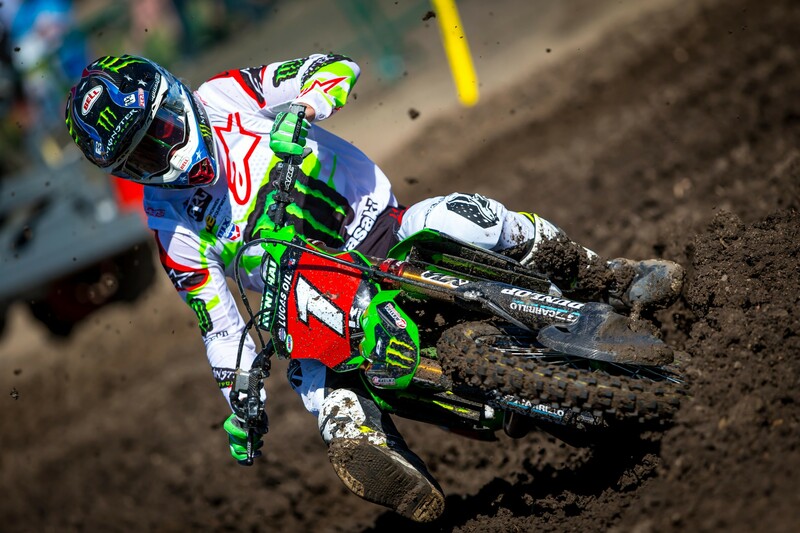 Tomac: It’s tough to say. You always want to be in front if you can, but Ken was riding awesome. Today the roost was not fun to be behind someone, so I had to be patient and try to find a couple lines. Ended up finding a few little outsides here and there, and maybe a little sneaky inside. Just kind of trying to find some lines to get momentum up. Eli, that step-up over there? When did you find that? Before the big triple. You were making up a lot of time on Kenny there. When did you find that line? Tomac: Just in the morning. In the motos, it actually was just as braking bump, really, and you could just jump over it and double it. Eli, your training partner won the 250 Class, Jeremy Martin. Talk about the relationship you guys have, and then you both winning today. That seems pretty cool. Tomac: It’s cool. It’s been good to have a guy there. In the past, I was kind of a just by myself guy, which was probably kind of weird, but it’s been really nice having someone there. We’ve been able to push each other and it’s been good. Team Cortez took the win. Blake, what’s your plans with the off-week? Is it testing? Is it training? What do you have focused on to try to get up there and battle these guys for the win? Baggett: Probably some of everything. Just some testing. Going back to Florida, so be in control of the environment, track, everything else. Go back there and do some testing and do some motos. Then if Kenny’s got his boat on the lake, I’m just going to hop on. I’m just going to sit on the dock and wait for him. Kenny’s going to drive by and be like, “That buoy looks like Blake. He’s bald!” I’ll be like, “Pick me up, bro!” I’m committing him right now, so everybody knows that if he doesn’t, I’m going to tell everybody that he didn’t invite me. Eli, you passed Kenny in the same spot in both motos. Did you have that spot picked out, or is that just when the opportunity presented itself? Tomac: It was just the spot I had a different line, I guess. I don’t even remember exactly where it was right now. Roczen: I know you planned it! Tomac: It was a spot I had some momentum. Did a little square and went up the inside. This question is for both Blake and Kenny. After that first moto I noticed—unless I missed something—you guys didn’t go to the podium. You went back to your pits, I think. Why was that? What was going on? 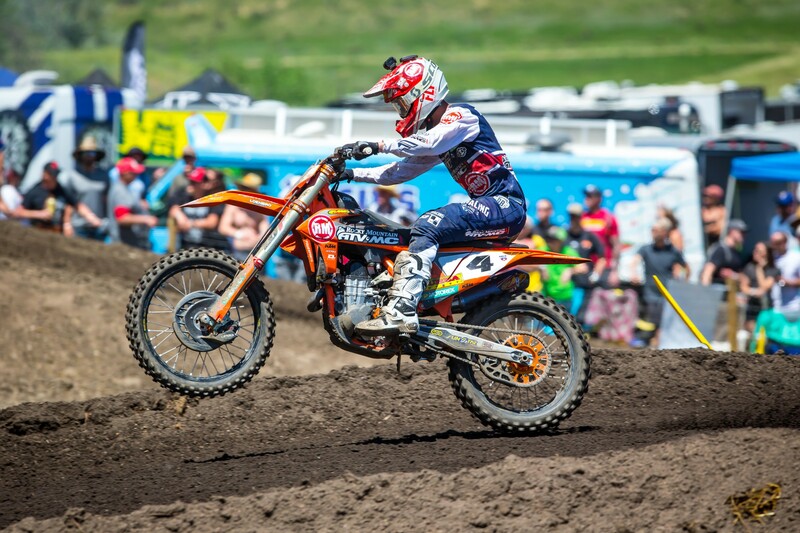 Baggett: They weren’t allowing number plates with the number 4’s on them to go to the podium. Roczen: I actually went to the podium, and I think we were such a time crunch they sent us back, so I walked back. I was pretty bummed. I would have just rather stayed on the bike and rode back instead of walking. Ken, today we have our grand marshal, an Olympian [Mikaela Shiffrin]. We were in the production meeting this morning and it was imperative that before anything happens, she gets a chance to meet Ken Roczen. What it was like meeting an Olympian here in Colorado? 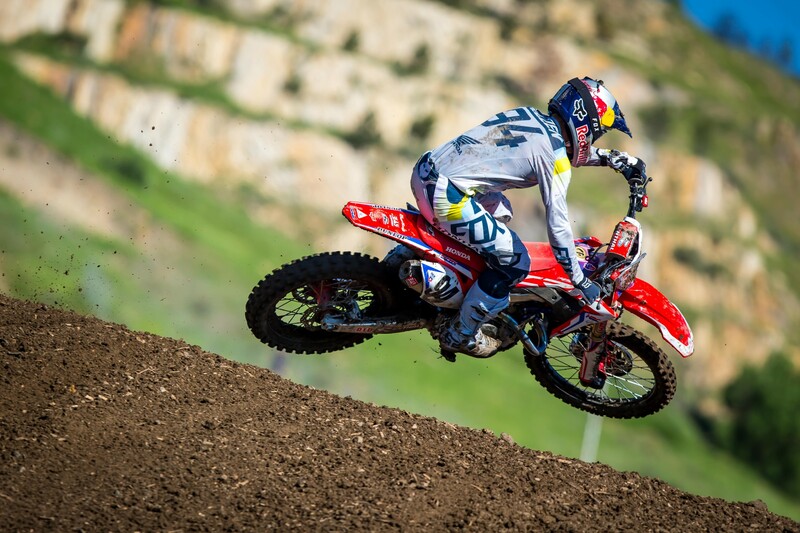 Roczen: It’s awesome. Mikaela Shiffrin. I watch her. I love any kind of Olympics, but I watched the whole winter Olympics and just enjoyed it a lot. So to be able to meet her was pretty cool. I knew that she was going to be here because her dad was actually my anesthesiologist for a bunch of my surgeries, so I knew that she was going to be here and stuff. I know her dad pretty well.